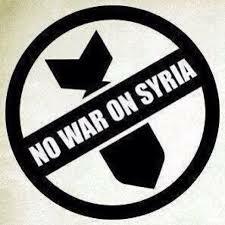 Lobby Congress to take a no-war stand. Pres. Obama has said he will consult with Congress before attacking Syria. We the People need to tell Congress to block any US military aggression! Here in Oregon’s Willamette Valley, we’re taking the message to congressional offices in Eugene on Tuesday, Sept. 3. See the press advisory below for more information on the lobby visits and email us — info [at] vfpcorvallis.org — with any questions. And … please see the VFP national action alert on Syria with a good list of 11 reasons not to attack. This entry was posted in community event, protest, Veterans for Peace. Bookmark the permalink.